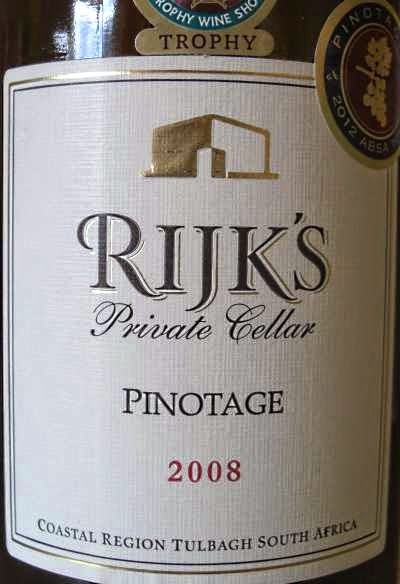 My Wine of The Month for February is Rijk’s Private Cellar 2008 Pinotage. Rijk’s – pronounced ‘rakes’ – was created by the Dorrington family in the Tulbagh valley and named in honour of Rijk Tulbagh, governor of the Cape from 1751 to 1771, who gave his name to the town and valley. 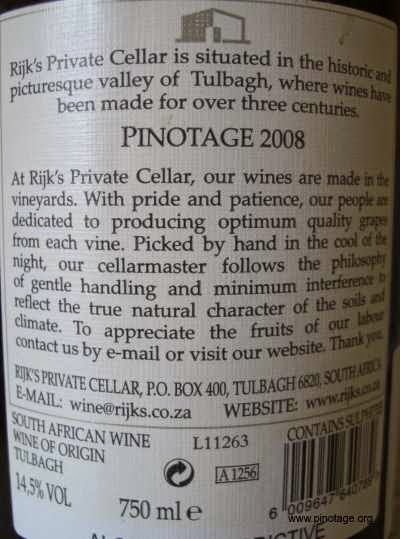 Rijk’s wines achieved almost instant success from their first bottling in 2000. This grapes for this wine were handpicked at night at the beginning of February, then underwent 48 hours cold maceration at 10° C, prior to fermentation and underwent malolactic fermentation in barrel where it was allowed to mature for 20 months in 60% French and 40% American oak barrels, 50% new, 40% 2nd fill and 10% 3rd. It was bottled in September 2010 and released in March 2012 after 18 months bottle aging. The wine is a beautiful bright cherry red colour. It’s tight in the mouth, but opens up with time. Rijk’s website recommends the wine be decanted for 1 hour before consumption. This is good advice, which I wish I’d had taken. It’s a powerful and elegant wine, with restrained fruit flavours and a structural tannin core. I don’t think I’ve ever had a Rijk’s wine that didn’t delight, and the only disappointment with this wine is that this was my last bottle of this vintage. 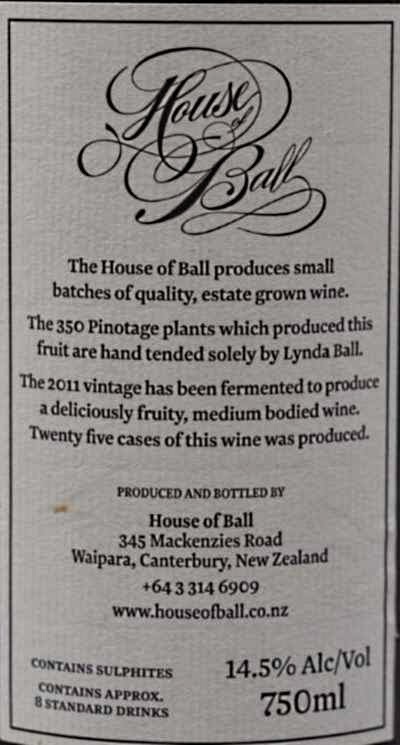 While in New Zealand I heard a whisper of an estate called House of Ball growing Pinotage to use in blends, but found their website showed they also made a 100% Pinotage. 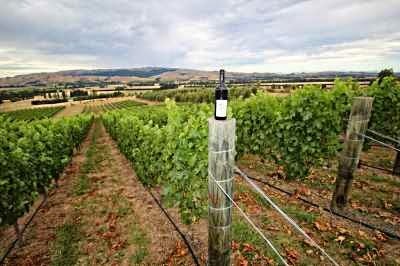 House of Ball is in the Waipara Valley north of Christchurch. As we were spending our last few days in Christchurch before flying home, and our route south from the Marlborough wine region would take us close-by, we decided to pay a visit. Armed with the address and Google maps we easily found their road leading out of Waipara, but after a while the tarmac ended and we were on dirt and gravel. Then the road divided – we took the one that was slightly larger and continued up the side of the valley. There were no signs and the road got narrower, then it divided again. We could see no sign of vines or building and so I called their number but got an answerphone. So we found a place to turn and headed onto Christchurch. From our hotel I emailed the winery asking if I could buy a bottle of their Pinotage and have it couriered to our hotel before we departed. “Yes,” came the answer and, even better, owners Lynda and Julian Ball would deliver the wine personally. The Balls run a boutique B&B alongside their vineyard and guests receive detailed instructions on how to find the property, and they’re not open to casual visitors, which is why there were no signs but it turned out that we were quite close. 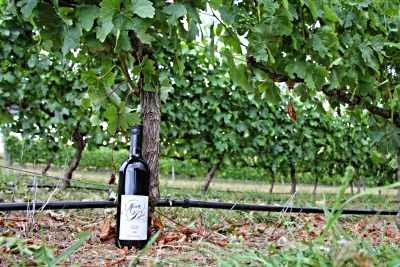 The estate covers 80 acres with two acres planted from 2004 with small quantities of seven different varieties. Pinot Noir, Riesling, Gruner Veltliner, Pinotage, Gewurztraminer, Chardonnay & Tempranillo. There are 350 Pinotage vines out of a total of 3,000. 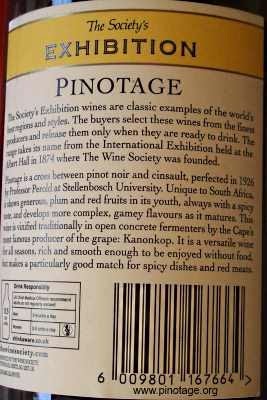 “So why Pinotage?” I asked. Because Lynda had previously worked as Vineyard Manager for Muddy Water on the opposite side of the valley where she cared for their Pinotage block planted in 1993. 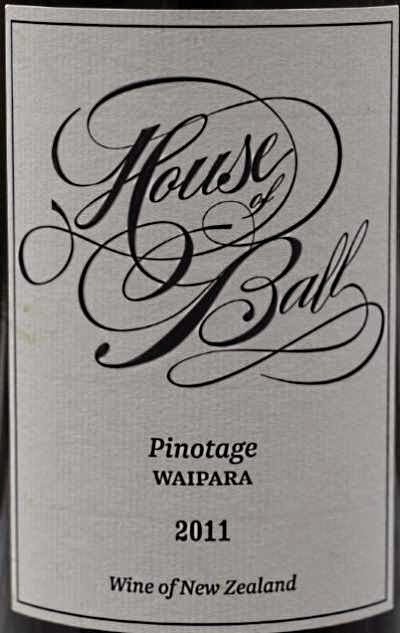 House of Ball 2011 Pinotage was one of a handful of wines I carried home to England. 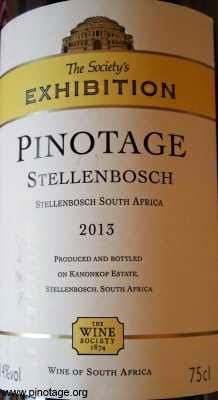 This Pinotage is clear bright red, with an attractive nose and clean berry fruit flavours of plum and blackberry with a good finish. A really nice drinkable wine whose 14.5% abv is not obvious. House of Ball is a most welcome addition to the Pinotage family. 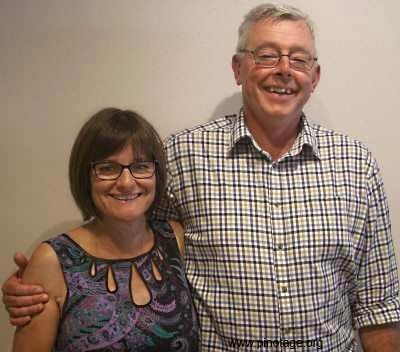 Photograph of Lynda & Julian Ball by Peter F May. All other images copyright of House of Ball. Used with permission.